Any large garage or workshop will be filled with every kind of tool for every type of job, and though often not considered manly, this includes situations that involve cleaning up tough messes. 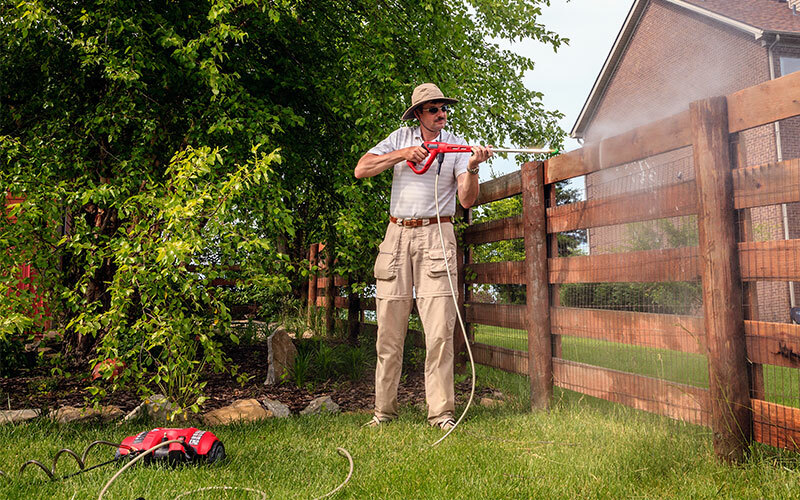 For us, our favorite tool for those particular tasks is our trusty electric power washer. Indeed nothing makes the arduous task of cleaning cobwebs off the house or grime out of concrete easier or more fun. We have been known to be found pretending we’re Ghostbusters and singing their theme song while using them. It really is a shame more people don’t own one! It is with this thought in mind that we have compiled the officially sanctioned by Stuffoholics list of the top 10 power washers so that you can find the best electric power washer that’ll live up to your expectations. Enjoy! We’ve been using pressure washers for years and have had both washers that were little better than squirt guns and actual marvels of technology. Seriously some of these things were closer to water cannons than household machines. Nevertheless, we felt the need to go further and increase our knowledge of contemporary devices for this review and as such have done more than 60 hours of intensive research. With this study, what we felt was sufficient community-based usage data, and personal testing we have shortlisted the following machines as the top 10 products currently available. As we maintain an efficient protocol to sorting out the best quality at a reasonable price, we did not focus on any particular brand. Instead, our fact-based research is driven towards finding out the best product available in the market today. Accordingly, we have come up with a list of the top electric power washers in the market, ghostbusting abilities notwithstanding. What Exactly Is An Electric Pressure Washer? 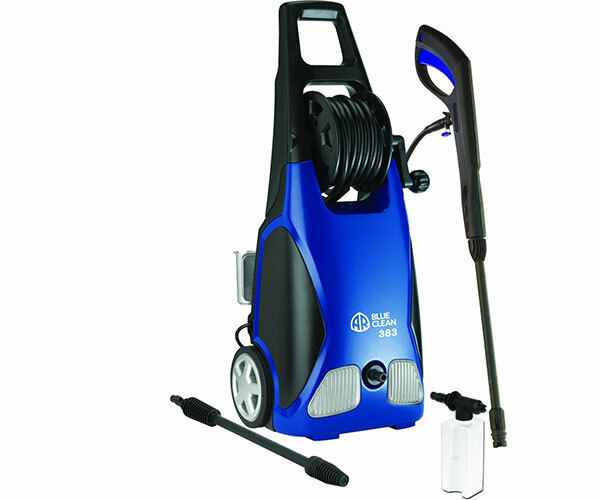 An electric power washer is a specialized electric water pump that is designed to be used as a cleaner. Electric Pressure washers consist of an electric motor driven pump intended to be connected to a steady water supply to go through pressurization and spray out through a wand with an adjustable nozzle to dictate stream intensity. The user then uses the resulting force of the pressurized stream to clean hard surfaces of various indoor and outdoor objects from filth. Typical uses of electric pressure washers are to clean grime and mold from concrete and to remove cobwebs from patio furniture. The machines sometimes include soap or cleaner reservoirs to mix into the stream of water to enhance cleaning ability. Though they sound complicated and bulky, most pressure washers are in reality quite portable and straightforward to use. Regardless of whether you require one for your chores like your annoyingly easy to get dirty, and then even more tedious to get clean, patio furniture or for some savvy business applications, using the best electric power washer for you is not only convenient and fun, but a downright necessary cleaning tool. Pressure washers can make it possible for you to clean different types of surfaces and places that would otherwise be painful and take ages, again, concrete anyone? This is why rather than relying on third-party cleaning services and spending a small fortune to have them bring their washers to you, you would be financially unwise and to be honest, downright foolish, not to open your laptop and order yourself a machine right now. Wouldn’t you prefer to comfortably, conveniently, and affordably take matters in your hands and clean your property yourself?. After all isn’t that old saying almost always correct? “If you want something done right, you have to do it yourself! The cheapest and least powerful option, light pressure washers, are for small tasks. For example, if you live in an area with relatively light precipitation and your patio furniture barely gets dirty a light washer would be a practical investment to speed up its cleaning process. 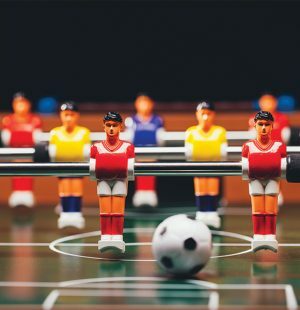 The tradeoff, however, is that these guys won’t put even a dent in more substantial tasks. As the name suggests, medium pressure washers are the more powerful version of light pressure washers meant for more onerous tasks. Indeed, as anyone who has used one will tell you medium pressure washers make cleaning driveways or well-loved decks a joy. Though because this is made possible by their using a higher pressure of water and more powerful pumps they do cost slightly more. Top of the line products are the most powerful electric power washers around. They use pumps capable of generating up to an incredible 2,800 pounds per square inch of water pressure in their streams. Indeed, Top of the line products can act like magic wands when making even the toughest of oil and grease stains disappear from any material. Though these washers often come with a higher price tag, they are more than worth the price! 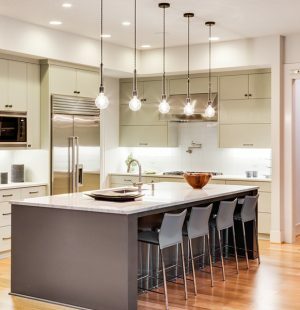 The Biggest thing to focus on is obviously the number of features that you think are good for effective cleaning. Things like the power of the motor in PSI or horsepower, the amount of water it uses in an hour, types of spray nozzles that are included and if you need them, if detergent tank is removable or not, if it has a pressure hose, the length of power and pressure hose for that matter, if it has a GFCI module, how environmentally friendly it is etc. All of these should be regarded as some of the most important features of an electric pressure washer. The design should be ergonomic and portable as you’ll be doing a lot of moving around with your machine as you clean. As such the weight needs to be light enough for carrying without you tiring, or even worse, hurting yourself. 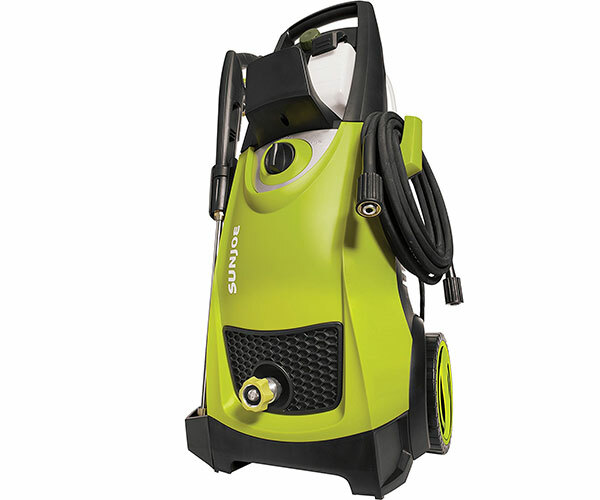 Last but not least, the best electric power washer usually comes with attractive designs though what exactly that means is up to you. 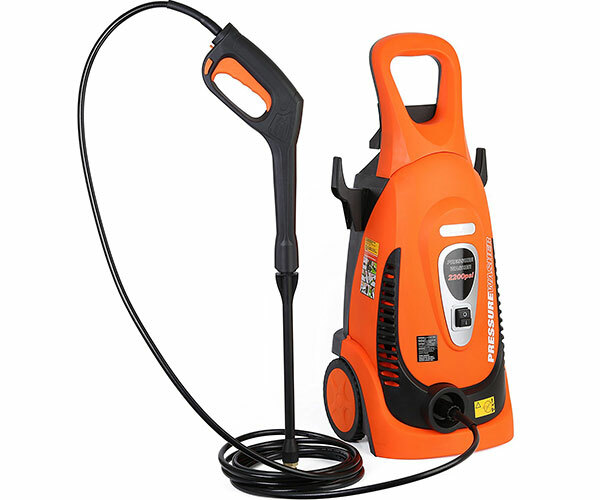 The build quality of the best electric power washer is high quality as breaks can be dangerous with the amount of pressure involved, not to mention that mixing water and high voltage electricity is always unsafe. As with any investment no matter how small a good warranty is also a key feature in a good pressure washer as any break that does occur needs to be repaired before using the machine again and if covered by a warranty that’s both a savior to your wallet and a time saver. Not a huge deal but often helpful and great fun special features can often help make deciding which power washer to buy easier. Special features can be anything not usually included in a machine whether it be thermal sensors, self-storing capacity, foot operated switches, or a foldable hand crank, all are possible special features that can be looked for. Probably the most significant reason you bought the machine in the first place the performance and effectiveness of an electric power washer depends on the build material and motor power and should be paid close attention to. If a power washer’s performance all of a sudden worsens check it for any breaks and take it for repairs if under warranty before using it again. Our selection process was rigorous and consisted of practical testing data which was produced by a number of volunteers actually using a variety of pressure washers then recording the results. The considered opinions of electric power washer experts and their personal choices also contributed to our efforts to compile this list. Out of the 70 electric power washers that we collected data on we ended up testing 50 in person in a rigorous regiment of outdoor exercises, including moldy concrete, filthy patio furniture and a variety of unspeakable stains. While it would not be right to say that any one of the tested units was flawless in its performance in these test it can also be said that no one is anyone truly ever perfect. Nevertheless, based on our very scientific selection process we have shortlisted the best of the best and have compiled only the top ten here. The features that our volunteers focused on included the design, quality of materials, motor specifications including PSI generated and horsepower, cleaning ability and technologies such as detergent tanks, hose pipe quality, automatic shutdown functions, dirt destroyer hose pipes, GFCI module performance, power cord length, pressure hose length and flexibility, safety lock switch, thermal sensor performance, certifications, and warranty. Based on the above research regimen, using the best in expert opinion and power-washing science, we have sorted out this Top 10 Best Electric Power Washer list. In this section, we have analyzed the 38 most important features for each product we have selected. Our research report is open for our readers to view to help them choose the best product although we do ask that they like any one of our many social media accounts to make the report viewable and prevent us from having to charge to view our articles. This features a long 35-foot cord which allows for high versatility. It also has a powerful 1800 watt motor that has a heavy 2030 PSI for excellent use. research we analyzed precisely 38 features for every product we researched. Out of those 50 the Sun Joe SPX3000 had the highest number of positive traits with minimal drawbacks that made it top the list. the SunJoe SPX 3000 generates up to 2030 PSI of water pressure and has 1.76 GPM of water flow for maximum cleaning power. Equipped with a dual detergent tank system the washer runs and stores two different types of detergent simultaneously. We compared the rate of which each of the products received its first 30 reviews and found the Sun Joe SPX 3000 gained ratings with exceptional speed. It received its first ten scores in less than a day, the second ten ratings in another day and third ten ratings in the day after that. 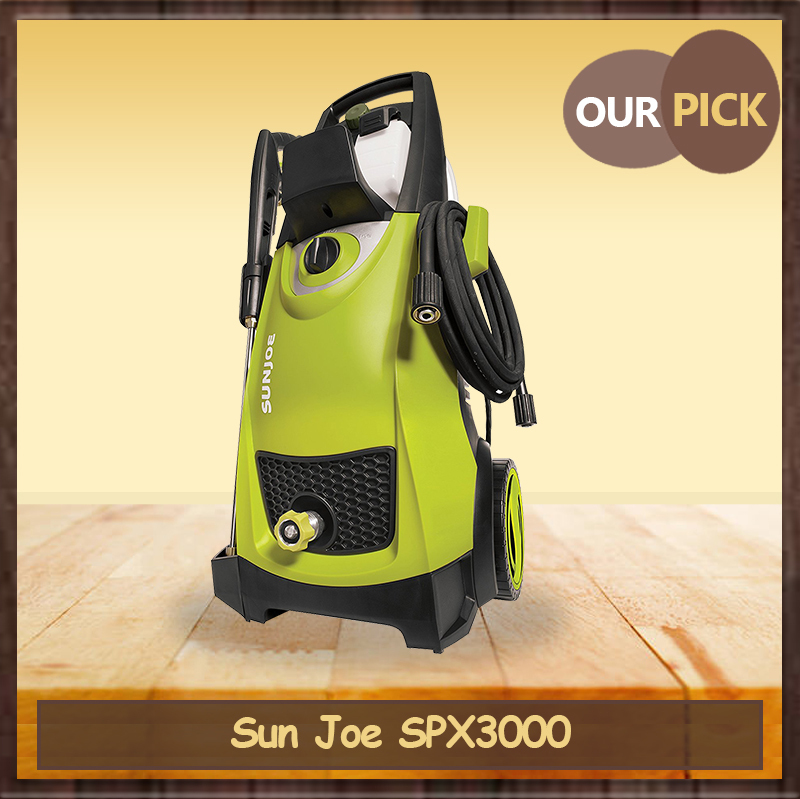 The Sun Joe SPX 3000 also won the right to be named our number one pick due to the fact that it is unique in the way of its removable detergent tank and official CSA listing. Though unimportant to some when buying the Sun Joe SPX 3000 has a 35-foot long power cord that genuinely becomes a godsend when like us your house lacks power outlets on the outside. However, with a power cord this length it becomes a moot point since you merely plug in at one place and walk away, letting the power cord cover the distance between you and the outlet without any need for extension cords. The safety lock switch helps prolong the life of the pump by shutting down the washer when the trigger is not engaged. This also saves energy and allows for quick shutdown in the case of an emergency, making the Sun Joe SPX 3000 safer than other washer models on the market without such a feature. The Sun Joe SPX 3000 Electric pressure washer features two removable 0.9-liter detergent tanks in order to carry or two different detergent agents at the same time. The machine also features a dial to switch between the detergents when both tanks are installed. For our Canadian readers, this point will be of particular interest. The Sun Joe SPX 3000 is a fully CSA approved machines allowing it to be sold and used all over Canada and the United States. The motor department is where the Sun Joe SPX 3000 really shines. Its 1800 watt 14.5 amp motor generates up 2030 PSI of water pressure to create a stream of sheer cleaning power, making this device suitable for jobs of any size. 35-foot power cord makes the washer highly mobile. Designed with removable detergent tanks. No quick change wand is included with this design. The pressure wand hose is only 20 feet long, though this is somewhat mitigated by the power cord length. The Sun Joe SPX 3000 is a fantastic piece of cleaning technology with a plethora of built-in features to make any heavy-duty outdoor or even indoor cleaning task a pure joy. Though its large and bulky design was sometimes hard to deal with. This item packs a punch with a turbo spray lance that gives you more control for your washer. 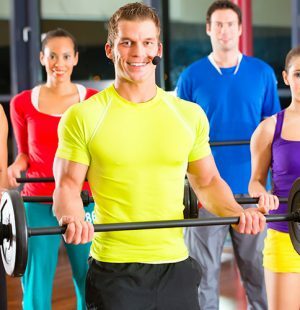 It is highly affordable and easy on the wallet compared to others. From our research report, you can see that the AR Blue Clean AR383 does not have the lowest price point among all the products we have listed. It does, however, come with more positive and effective features than any other entry for its price point. The AR383 features a 1.5 horsepower, 3 amp universal motor and tri-axial pressure washer plunger to pump water at a peak stream pressure of 1900 PSI. These traits are responsible for the AR383 rocketing it to the second place on our list and our product for those shopping on a budget. Our research report shows that the AR Blue Clean AR383 ranked third highest in positive features in the washers that made our top ten. This really made a difference to its ranking since the affordable price point made these features available to many who would otherwise have to do without. By this parameter we found the AR Blue Clean AR383 performed admirably. It received its first ten ratings in six days, its second ten ratings in ten days after that, and its third ten ratings in only seven days after that. The AR Blue Clean AR383 also includes a unique feature not found on almost any other washer on the market, known as a Turbo Lance, which can increase the power of the stream by up to 50%. The secret weapon of the AR383 comes in the form of an attachment known as the Turbo Spray Lance. While initially appearing to be just another add-on it is the equivalent of doubling your washer’s power when attached. Creating a beam of ultra-high pressure water that pulsates and rotates to clean like magic. This was perhaps what caught us most off-guard when researching this electric pressure washer, we loved the features, Especially that Turbo Wand, but we were fully expecting to have to discount it due to a high price point. Imagine our surprise when we found the AR383 to have one of the best price points among all the machines reviewed, let alone for one with its performance and unique features. This is balanced by the fact that the AR383 only has a one year warranty, however. The AR383 makes use of quick easy-to-use connection system to speed up the setup of pressure hose, the water supply, and another critical element of the washer. The AR383 has one of our favorite features that is beginning to appear in Pressure washers, extra long power cords. Nullifying the need for extension cords and making the tedious unplugging and replugging that often punctuates bigger jobs a thing of the past the 35-foot power cord on the AR383 really is a selling point for it. Due to its unique compression speed and way of spreading its water spread the AR383 is over 50 times more effective at cleaning than a garden hose at cleaning task, though with limited detergent it struggles. Nonetheless, due to these same factors, it uses nearly 80 percent less water, making it more environmentally friendly as well as more efficient. Detergent tanks are small and non-removable. Just because it’s our budget pick does not mean that the AR Blue Clean AR383 is cheap. Quite the opposite, in fact, it says that this reasonably priced piece of pressure washing machinery simple gives you a fantastic bang for your buck. Filled with features to make your life easier while not breaking the bank, with this in mind, here’s our review of the AR Blue Clean AR383. This bad boy is highly advanced for so being affordable. The safety features are out of this world with a total stop system that saves the lifespan of your motor. This cousin of our top pick is one of the most advanced pressure washers available on the market that our research has found. Packed with a plethora of features that make it a versatile workhorse and all-around great electric pressure washer the Pressure Joe SPX3001’s first innate advantage comes in its mighty 1800-Watt/14.5-amp motor. This powerhouse pump is capable of generating up to 2030 PSI of water pressure and when combined with the 1.76 GPM of water flow generated creates an almost unbeatable stream of pressurized cleaning power. To make things even better the SPX3001 comes equipped with an extra-large 40.6 fl oz (1.2-liter) onboard detergent tank – perfect for blasting dirt and debris off your windows, cars, RVs, boats, ATVs, trailers, siding, barbecues, and more. Regarding how fast it received its first thirty reviews the SPX3001 performed well as reported by our research. It won the first ten ratings in three days, its second ten ratings in two days after that and its third set of ten scores in just five days after that. The Sun Joe SPX3001 also shines in an area that it indisputably topped. Durability and the ability to just take an immense amount of wear and tear. Indeed none of our other tested products had even close to such a supremely engineered ultra-durable design that made you realize the machine was built for years of long-lasting high-performance use. However, even after adding such a plethora of great features and considering the innate design advantages, the price of the SPX3001 is not the highest on our list. If your budget is within $180, this pressure washer is well within your budget, so if you need to find a durable machine for all your outdoor favorites, this is the guy. The Sun Joe SPX3001 is built with a total stop system, meaning that upon the release of the trigger the motor running the triplex pump immediately shuts down. This serves not only to preserve pump and motor life but also to increase safety by playing a second role as an emergency shutdown switch. The 14.5 amp motor of the Sun Joe SPX3001 is capable of generating a monstrous 2030 PSI Beam of water. Capable of cleaning even the toughest of stains from concrete and other materials. However, for the environmentally conscious it does tend to use a lot of water. We love this feature so much it almost makes up for the lack of removable detergent tanks as it makes getting second story stains, underneath decks, and other hard to reach places easy as cake. When matched with the awesomely long power cord the extension wand becomes a super cleaning tool as you clean underneath cars and behind grills and for those of us so inclined in the autumn, blasting leaves out of gutters. The Sun Joe SPX3001 is a buy that will last you a while with its braided power cord, steel instead of the typical plastic for its wheels it is built to last. As such it is more than the most durable power washers we’ve included here, but probably one of the most durable we’ve ever seen. The 14.5 amp motor creates a 2030 PSI beam of water, a beam of pure cleaning power. This guy can take a beating. No we really mean it, the Sun Joe SPX3001’s most notable trait is that it is the most durable machine on this list by far. While for many this would be enough to convince them to buy alone, it does also have other features that can help persuade those of you still unsure whether or not it’s worth the money. Don’t let the size of this machine make you second guess your purchase. Its lightweight but has the power you need to get the job done how you want it. 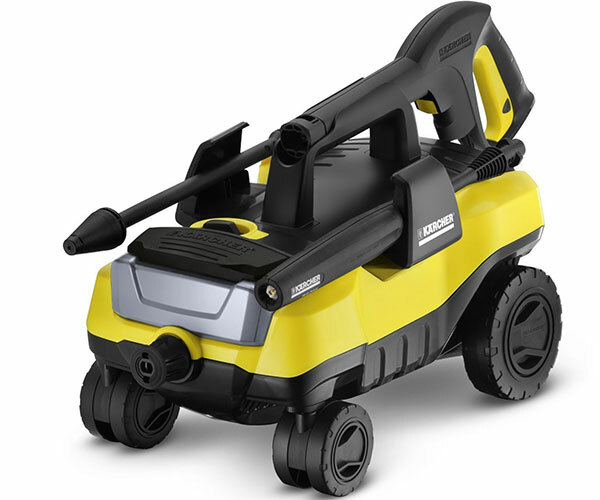 The reason for the Karcher K3 Follow-me being our best compact choice is not just the remarkable rhyming in its name. No, it’s that it genuinely is a small, lightweight design full of the useful well thought of features. The unit delivers 1800 PSI making the K-3 OK for home use. To put the level of power provided by the K-3 Follow Me in perspective compare it to your standard garden hose. This somewhat low power is somewhat mitigated however by Karcher having some of the most effective wands out there, turning the potential issue of water flow into an advantage of the K-3 Follow me being conservation-friendly as far as water consumption is concerned. For those shopping on a budget, you’ll be pleased to know that the K-3 comes with a very reasonable price tag that is around $100. When we compared the frequency at which all the products we researched were rated the Karcher K-3 Follow Me had received its first thirty reviews at an astounding speed. It received its first ten reviews in just eight days, its second ten reviews in the following nine days, and third set of ten reviews in only five more days. The signature feature of the K-3 is its Vario spray wand which allows you to switch between low and high pressure without actually having to stop and switch out the nozzle you are using saving, time energy, space, and time looking for where you put your other nozzle. The N-cor maintenance-free pump is another selling point touted by Karcher for the K-3 follow me, claiming that it never needs to be cleaned or serviced. While this may be true, the pump is confirmable in how low the amount of water it pumps out every minute is, more than likely stemming from the relatively weak 13-amp power of the motor powering the pump. The K-3 has the unique design feature of looking more like a strange toy car than an electric pressure washer on its four wheels. This is due to the design being meant to be dragged along as it’s used, rolling after the user. This unique method of moving the machine while in use makes it a highly mobile device and great for tasks spread over large areas, as a bonus for everyone this means that the K-3 also includes a 35-foot power cord to help make moving easier. The K-3 is little larger than a toy car and is incredibly lightweight because of this. The size makes storing the K-3 Follow Me electric power washer child’s play and a joy for those with space restrictions. The compact design also makes the K-3 highly portable, allowing it to be transported to faraway tasks. Though the tradeoff is that the design lacks CSA certification due to its oddities. 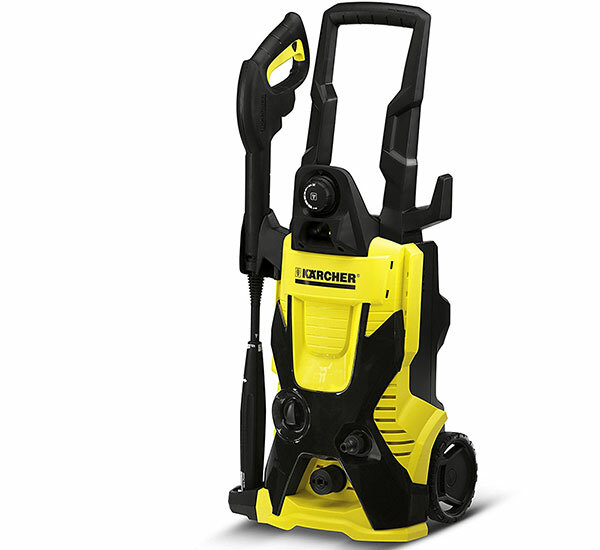 The Karcher K-3 Follow Me electric power washer has several features that make it unlikely to compete with larger electric models but great as a small compact design. Though not as powerful as other designs it is unbeatable as a lightweight pressure washer. The Blue Clean will not let you down. It is made for outside use and lets you turn work into play. It gets all the grime off everything to make your life easier. 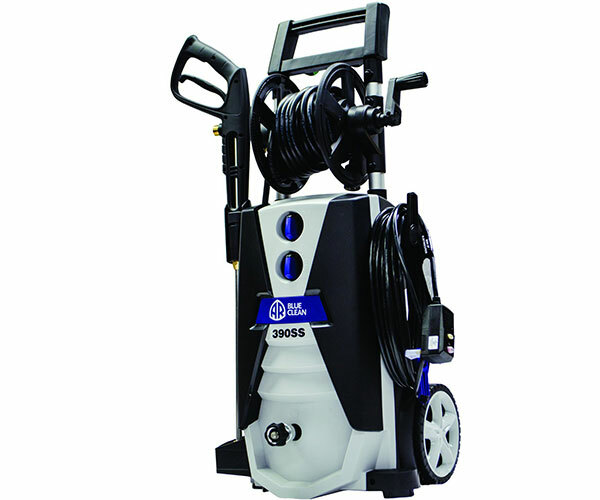 The reason we selected the AR Blue Clean AR390SS 2000 PSI Electric Pressure Washer as the best electric pressure washer for outdoor cleaning is that its unique features and rugged, sturdy, design make the cleaning of outdoor items fun. 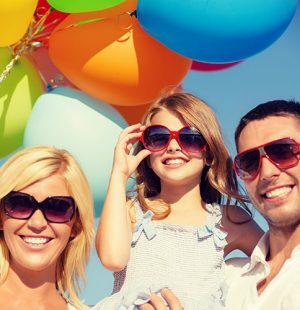 Making cleaning items such as decks, patios, sliding doors, driveways, outdoor furniture, cars, trucks, RVs, ATVs and much less like chores and more like a host of fun outdoor afternoon activities. As a machine its cleaning power comes from a reasonably powerful 14 Amp / 1.6 HP universal motor and tri-axial pressure washer pump that can consistently deliver a 2000 PSI stream of high-pressure water at a flow rate of 1.4GPM. When we compared the rate of which the products we reviewed had gained their first thirty reviews the AR Blue Clean AR390SS was evaluated at a very respectable speed. It received its first ten ratings in seven days; it received its second ten ratings in just nine days after that and its third ten ratings in thirteen days after that. If for your needs you require a durable yet incredibly powerful, electric power washer that can generate professional results the AR390SS is more than likely to be the best choice for you. The AR390SS is built with a tremendous amount of dirt, grease, and grime in mind as its enemy, enemies that require a lot of soap to deal with. Therefore, its designers built it with a mammoth detergent reservoir of 48 0z that is unfortunately not removable. Nonetheless, you won’t find yourself often refilling as you clean which is good news for those pressed on time or not exactly wanting to carry a bottle of detergent with them. By this point in the list you probably know that we love long power cords, what can we say? We find them convenient with the extra reach and mobility they give you. But to make it, even more, an excellent pick the AR390SS is sporting not only a 35-foot power cord but also a 30-foot pressure hose, making usually impossible to reach angles and places now child’s play, have fun dragging the thing around when you have to though, it is heavy. While not the most robust motor outright on this list, the AR390SS’s 1.6 horsepower, 14 amp universal motor is paired with a tri-axial pump to generate a more than respectable and devastatingly effective, though not adjustable, 2000 PSI stream of water capable of cleaning any job industrial, personal or otherwise. We also never noticed any sign of the common pressure washer problems during the long period of time we used this product. The AR390SS conserves water, and in turn the environment by using significantly less water than a garden hose while being notedly more effective at removing all manner of debris. Detergent tanks are not removable. The worst of the worst regarding filth for pressure washers is not going to be found in industrial workshops or garages. It’ll be seen outside, which is coincidentally where pressure washers will also find the most damaging things to their operations, therefore only the most durable and the most powerful can hold the title of the outdoor pressure washer. Among these is the excellent AR Blue Clean AE390SS, filled with features and our pick for the best electric power washer for outdoor use. The Ivation is easy to use for your heavier cleaning needs. This machine is a powerhouse with 2200 PSI making the task less of a burden. Just point and spray. 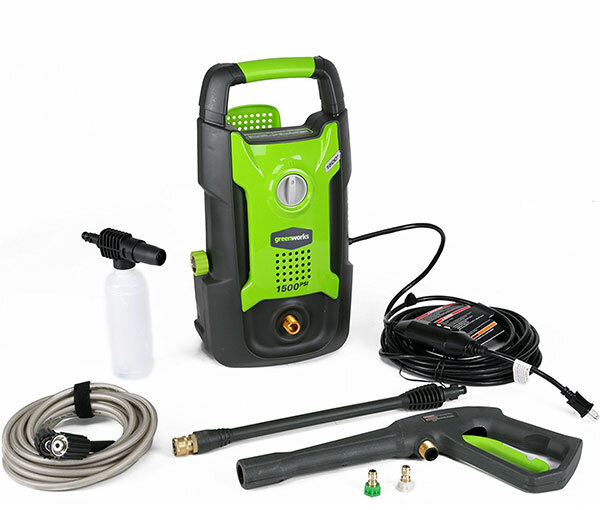 The Ivation electric pressure washer is built to include a Total Stop System, a safety feature designed both to increase the life of the washer’s motor and pump and the safety of the user by making the entire machine turn off any time the trigger is released on the wand. This is an excellent safety feature for any pressure washer, both personal and industrial, to have. To say that the Ivation is an incredibly powerful machine is a bit of an understatement. Its 1.6 horsepower engine generates a whopping 2200 PSI of water pressure and creates a stream capable of decimating any cleaning job that it’s pointed at. A design drawback, however, comes in the way that you cannot adjust the spray making the stream strong and directly unsuitable for lighter jobs due to the risk of damage. The Ivation includes several alternative nozzles and makes switching them out fast and easy with the help of a unique system of quick, easy-to-use copper hookups. These save time and hassle for anyone who hates the usual messy pain of screwing and unscrewing nozzles. 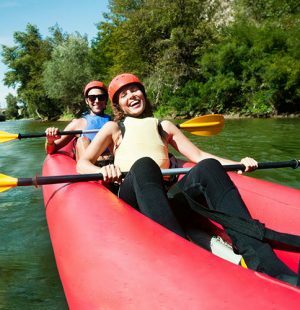 The extra option also helps to mitigate the pain of being unable to adjust the stream. The turbo lance is an excellent unique feature that the Ivation has in common with many top-of-the-line industrial pressure washers. The lance can be used for every job under the sun, from patio furniture to car wash and it can be used to very precisely set the pressure of the stream from the usual heavy duty 2200 PSI used to clean oil from concrete to more gentle and delicate settings. The Ivation Electric Pressure Washer is a heavy duty washer with great accessories and a powerful motor. And though we love the strong motor and copper hookups it is the turbo lance that makes this washer shine. This little guy has an extending wand in addition to its hose. It’s one of the most accurate pressure washers on the market today while being compact. When compared to other light to medium electric pressure washer motors, the Sun Joe SPX1000’s is inefficient and all around terrible. The electrical engine is rated to 1400 watts, and just 11 amps of power, the water that does go through is a rather significant amount, adding environment inefficiency to the mix, and is pressurized to only 1450 PSI. While we initially thought the SPX1000 to be irredeemable due to its motor’s terrible performance we quickly found that we were wrong. The Sun Joe manufactured electric pressure washer is loaded with unique features and accessories to help turn it into an incredibly effective and versatile lightweight pressure washer. We found that our reach could be extended to a massive 33 inches with the extendable wand, which we made great use of while cleaning cars and gutters and used the adjustable nozzle to spray away grime with pinprick accuracy before cleaning siding with a 45-degree fan of exceptional cleaning pressurized water. The SPX 100 is also built with the industry standard safety feature of a total shutdown system, meaning when we let go of the trigger the motor shut down immediately to preserve its life and reduce the risk of an accident. When we did have problems with the motor and pumped the two-year warranty meant that when we did have an issue, we simply got it repaired, fully covered. While the biggest redeeming quality of the SPX1000 will always be its special features the ease of use did help to repair its standing in our eyes too. We loved its easy-to-carry, lightweight and compact design, due to its 33-inch extending wand we found ourselves reaching places we would otherwise grumble and whine about without thinking about it and because of its small size storage was easy after we had completed our tests. While we were at first disappointed with the SunJoe SPX1000 due to its subpar motor, we quickly grew to love it as a lightweight pressure washer that was full of accessories and supremely easy to use, making it well worth the price. If you have patio that needs washing, this is the way to go with its spinning patio cleaner. The washer has a feature that allows for the accessories to be stored on the machine. The Force 2000 really lives up to its name in the fact that it generates a stream of water that has 2000 PSI of force behind it, using a brushless induction motor to be at the cutting edge of engineering the Force 2000 is at the top end of pressure washers regarding power. Although it does have a monstrous 3000 PSI initial burst of power for those who aren’t impressed by the mere 2000 it usually operates under. The Force 2000 isn’t just about brute power though, its all about safety too. It’s built with the industrial common safety feature of the Total Stop System, a feature that immediately shuts down all functions of the pressure washer as soon as the operator lets go of the trigger, both prolonging the life of the motor and serving as an emergency shutdown switch. Also included are a thermal sensor on the motor to shut down in the case of overheating to prevent damage, a GFCI on the plug to prevent electrocution, and an automatic safety valve to prevent any explosions giving this our approval with flying colors in the safety department. The Force 2000 has a variety of special features and add-ons that come with it. Our favorite, however, is the spinning patio cleaner, which looks like your Mom’s floor brush on steroids and cleans like your mother on steroids with a floor brush! Other unique features include an adjustable soap dispenser which we found comes handy whenever trying to ration your detergents throughout particular projects. A spinning turbo Nozzle, and a separate multifunction nozzle. As well as self-storage within itself for all of these accessories. With the Force 2000 Powerhouse International has created an absolute beast of a heavy-duty industrial strength electrical pressure washer with many fun special features. Compared to other machines of a similar price we can’t say you’ll go wrong buying the Force 2000. If you don’t have a lot to clean but still need a pressure washer, then this is the machine for your life. It’s easy to set up and is cost effective. Perfect for smaller jobs. We will be honest here; we weren’t impressed with the motor and performance of the GPW1501 for the most part. While fine for cars and small light jobs it simply lacks any sort of bite to cut through larger jobs. This would not be a problem if you’re looking for a lighter pressure washer for small jobs though and would be great for just general maintenance, but for industrial jobs and heavy lifting its a no from us. The GPW1501 is a pressure washer’s association certified pressure washer with a super affordable price point of 78 dollars, a smoking deal if you’re in the market for a light pressure washer. The motor is a small affair that pumps water at a rate of about 1.1 GPM at 1500 psi. The pressure hose is a short 20 feet that is easy to repair. The power cord is a beautiful 35-foot long making the pressure washer very mobile and almost eliminating the need for extension cords and has the included benefit of a Ground-Fault Circuit Interrupters (GFCI) unit. The GWP1501 is disappointing in its lack of special features. The most significant and unique that we could find in our considerable time reviewing the product was the fact that the washer could be placed on its side or base though we found ourselves using this feature very very little. More useful, but less significant or unique was the quick connect system used by the washer, two connection points one 40 degrees on 20 degrees can be found on the front of the washer points. While not impressed overall with the GWP1501 when it was viewed only as a lightweight pressure washer it was seen to be perfect for its task. 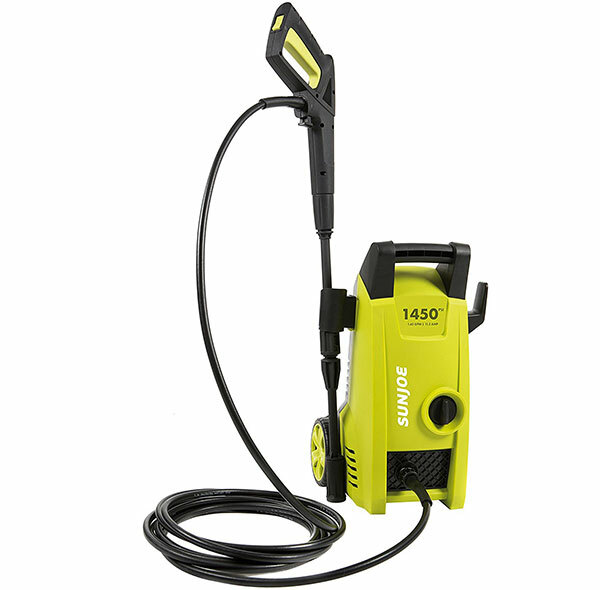 Its low price point and small size as well make it an optimal light electrical light pressure washer. This machine is the fan favorite. It has a child safety lock to prevent accidents & uses a water-cooled induction motor. If you want something that can do it all, choose this. The Karcher k 3.540 makes use of a water-cooled induction motor to deliver a stream of water at 1800 PSi consistently and quietly. The N-cor pump that pumps the water is incredibly smooth as we found the truth about the company’s claims that we would never have to service it. We found that the induction motor also started up faster, lasted longer and used less power than other non-induction electric power washers during our extensive research on the subject and test with a model of our own. The Karcher makes use of a child safety lock to prevent accidents but curiously lacks a total shutdown system that has become almost industry standard. To prevent meltdowns and prolong motor life the 3.540 is made with a thermal sensor that cuts power to the motor upon it growing too hot. Both of these features serve to improve battery life and our overall love of this machine. Moreover, the Karcher Nozzle Technology can make the cleaning process even more effective. This nozzle technology is simply the best version of all nozzle types. Probably our favorite part of the K 3.540 is how jam-packed it is with special features. Removable detergent tanks, variable detergent flow dials, quick connect systems, and built-in accessory storage are just a few we found ourselves really enjoying. It also has two different spray wands capable of increasing the overall power and adjusting the pressure known as the dirt blaster and various respectfully; we found that both really shone in their way when doing a variety of different tasks. The Karcher K 3.540 is a versatile medium pressure washer filled with special features small and large that make using it for a wide range of tasks fulfilling and easy, its CSA certification also adds certain security in buying for those who like to know what they are getting when they shop. Nevertheless, many who need power and durability would find the 3.540, even with all its bells and whistles, lacking in some key areas. Like any other machine, an electric or gas power washer needs periodic maintenance and some care to maintain its top form and do its best work. Most power washers need very little in the way of attention to function, like any power tool they should be dust-free and regularly cleaned to prevent the build-up of debris and mud. If either such substance becomes present, the user should use a cotton duster to facilitate removal, as the presence of debris can inhibit the optimal function of the pump and degrade performance. To prevent material fatigue and invisible problems after each session your washer should be kept out of the sun and preferably out of extreme temperatures as U.V radiation, and cold can degrade all synthetic parts of your machine slowly and over time lead to a catastrophic failure. Over time replacement of key parts of the pressure washer will also be necessary, gaskets are one such component, but eventually, the power wand hose will need to be as well. For the safety of the owner, operator, and those around the machine any major maintenance other than cleaning should be performed by a licensed professional who knows what they are doing and in any good machine will be covered under warranty. It has never been easier to find the best electric power washer for you than now with our Top 10 Best Electric Power Washer list. All that you need to do so is knowledge. Know what you need in the product you buy and in turn what features to look for, and you are set to go. 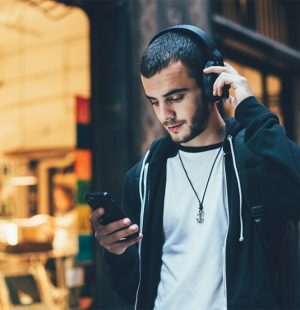 Major stores like Amazon, Walmart, and eBay have got these products you just need to be armed with a little knowledge and look in the right place. The same products are reviewed and rated within the websites of these online stores as can be found here. Use these reviews to guide you in your search and good pressure washing!